This must have been a fierce fire at the time! In the late morning, I reached Highway 62--the road into Mazama Village. I followed the road about a mile into the village. The main purpose was to pick up the food I mailed to myself, but while I was there, I could make phone calls and pig out on non-hiker foods. Near the pay phone, a huge line stretched by. Nobody was using the phone, though, so I approached it, joking that I hoped the line wasn't for the phone. No, they told me, they were waiting for campsites. These were the people who had not reserved a campsite and it was first come, first serve. They were hoping to beat the odds and get a site. I didn't say anything to them, but I thought, "There are about a BILLION trees out here where you can camp for free, and you're all jockeying for a bunch of picnic tables crowded with other nearby campers?" Then I thought, "Good. There will be fewer of you trying to poach near MY campsites." =) I'm turning so cynical. 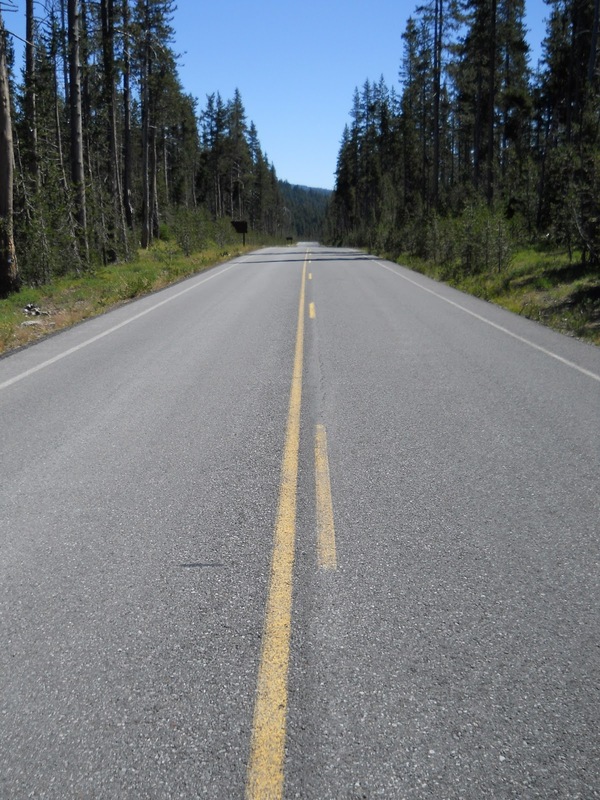 The road walk into Mazama Village. I pick up my mail drop, called Amanda and my mom, then ate a large lunch buffet at Annie's Creek Restaurant before following Annie Spring trail behind the complex back to the PCT. The trail climbed steadily upwards, up to the crater rim. At Dutton Creek, the trail splits. 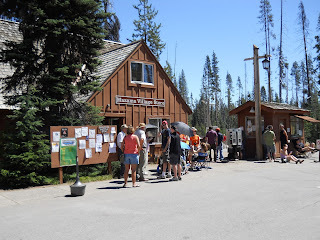 The official PCT goes around Crater Lake--horses aren't allowed up at the crater's rim--but I don't think a single thru-hiker on foot has ever followed it. Nobody wants to hike around Crater Lake--we want to hike on the rim! So horses turned left to follow a trail around Crater Lake, and I went right to the footpath to the rim. 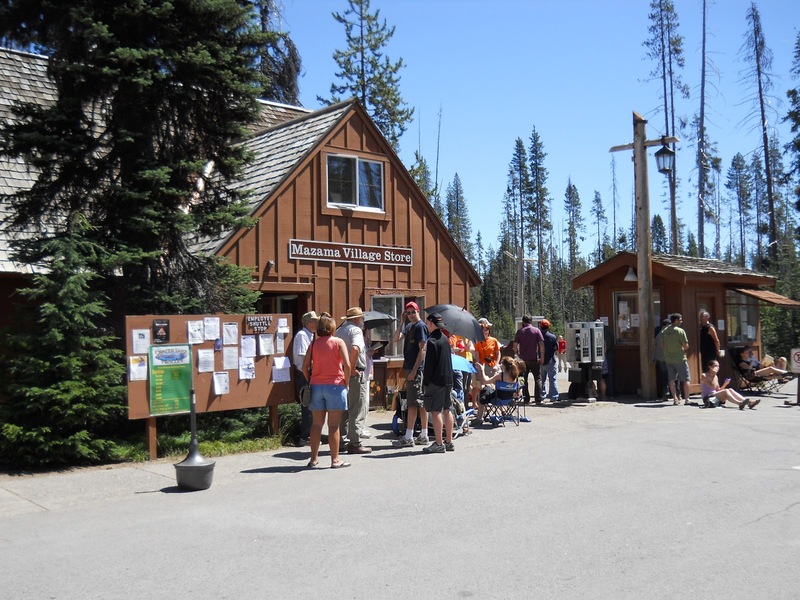 About four miles out of Mazama Village, I reached the rim at Rim Village. I stopped for a cold soda at the store there where I bumped into a few other hikers including Red Head, Just Dave, and Double D. Which is where I learned that I actually had passed Zero Zero and Fire Marshall when they got off the trail at Fish Lake Resort to pick up new shoes... or something to that effect. 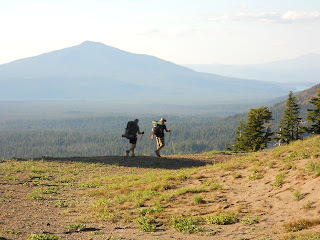 I didn't get off the trail to resupply there, which is why I never saw them. I was a little surprised that anyone would get off the trail to resupply there. Seemed too close since leaving Ashland, and it was twice as far off the trail as Mazama Village. I couldn't provide the three any information about how far back the two were, though, since I hadn't even seen them. Rim Village was crowded with people. Hundreds of them, milling around, admiring the views. I entered the store to buy a cold drink and felt positively claustrophobic in the store, pushing my way through the hordes of people. Didn't they have maximum occupancy requirements they had to follow? Because I'm pretty sure they weren't being followed. I must have reeked since my last shower was a few days before, but it was so crowded, that my reek alone was not enough to part the masses of people. maildrop was inside the store there. I bought a drink, finally stumbling out into the sun outside, and shook my head with disbelief. "Have you ever seen so many people in your life?!" I asked Red Head. "Holy crap!" The three eventually picked up and left as I sat outside sucking my drink. I also filled up with water--the rim of Crater Lake has no water sources and I did not expect to reach another water source for 25 miles. 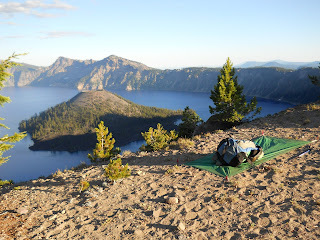 And I was left thinking about this historic landmark known as Crater Lake. 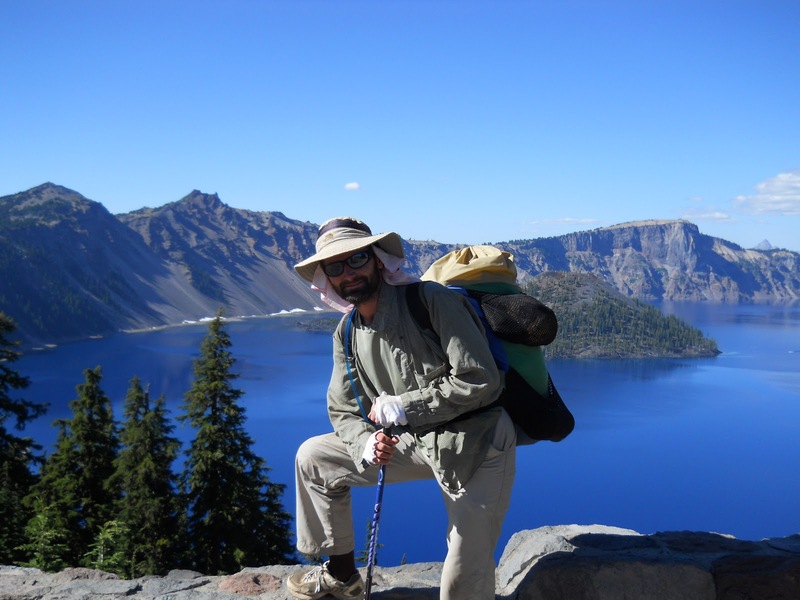 Sullivan liked it so much that he dedicated three hikes in his Hiking Oregon's History book to Crater Lake. I'd already done all three of them on past visits, but I revisited them in my mind. Crater Lake Lodge I could see a little ways off the east, the start of one of his hikes. It was built from 1909-1915 for the "relatively modest price of $50,000, the building originally opened with tarpaper on its outside walls and flimsy beaverboard between rooms." It was scheduled to be demolished in the 1980s but a public outcry saved it. Instead, it had a $35 million makeover and reopened in 1995 better than ever. I finished my drink, properly disposed of the cup, picked up my pack, and started hiking. I have been to Crater Lake a couple of times before, but today was the best views I've ever had of the park. Previous visits were obscured with smoke from nearby wildfires (I wondered if the fire area I hiked through that morning was the same fire that obscured the views on one of those visits), and once I drove through in the middle of the night only seeing the views by moonlight. Today it was clear, no smoke in the air, and the middle of the day. 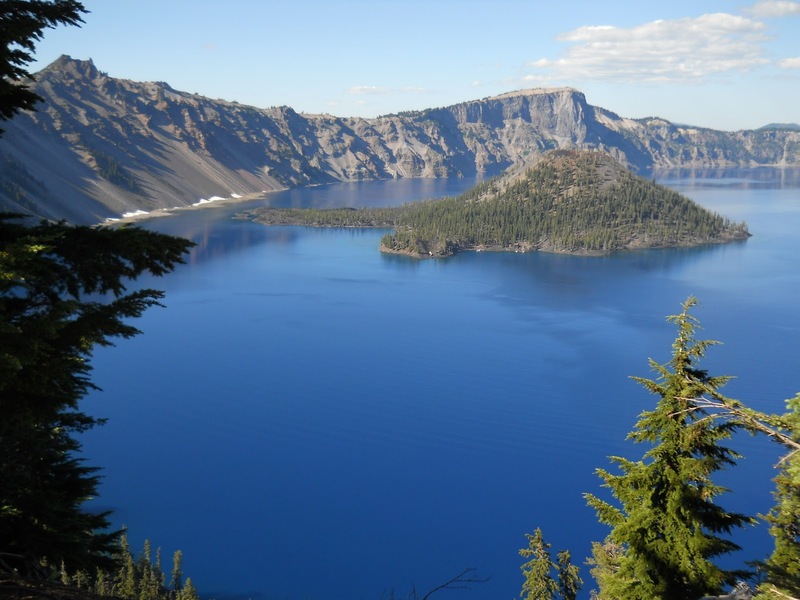 The deep blue water of Crater Lake sparkled like the jewel I'd always read about but never managed to see. There's a boat in the lake that will take visitors to Wizard Island, named since it resembles a wizard's hat. It looks like a tiny dot on the vastness of the lake, and visitors can disembark at Wizard Island to follow a trail to the top. I did this in a previous visit, and tried to pick out people on the island but couldn't see anyone. I wasn't sure if that was because there was nobody to see or if it was because they were too small to be seen, but I did pick out the faint trail that leads to the top. Interestingly, I decided, the views of Wizard Island are actually better than the views from Wizard Island. But I was still glad to have visited Wizard Island. 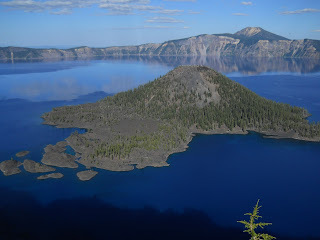 =) Wizard Island is another of the hikes described in Sullivan's book, this time exploring the geology associated with the area and the formation of Crater Lake (which, technically, is a caldera, not a crater, but Caldera Lake doesn't really have the same ring to it, now does it?) and Wizard Island (which, technically, does have a crater at the top). I asked a tourist if he could get a photo of me at the rim there--I hadn't been getting many photos of myself recently, but I figured I needed at least one with Crater Lake, thanked the man, and started hiking clockwise around the rim. The rim trail was remarkably difficult to follow with steep ups and downs. 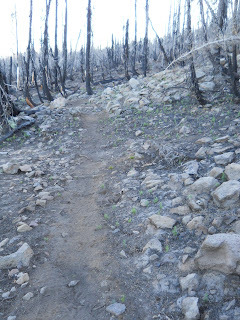 Now that I was no longer on a trail specifically designed for horses, they felt no compunctions about finding the steepest, most direct routes they could find. My hiking speed went down significantly, and I spent more time looking at my feet than the views of the lake. But wow, what amazing views! Even more remarkable, absolutely no tourists were using the rim trail. The only other people I found along the rim were the other thru-hikers. I also passed two more southbound thru-hikers who had started in Canada. actually shows up pretty well in my photos! I was told, down in Southern California, that this year there might not be anyone who completes a southbound thru-hike due to the heavy snow in the North Cascades. 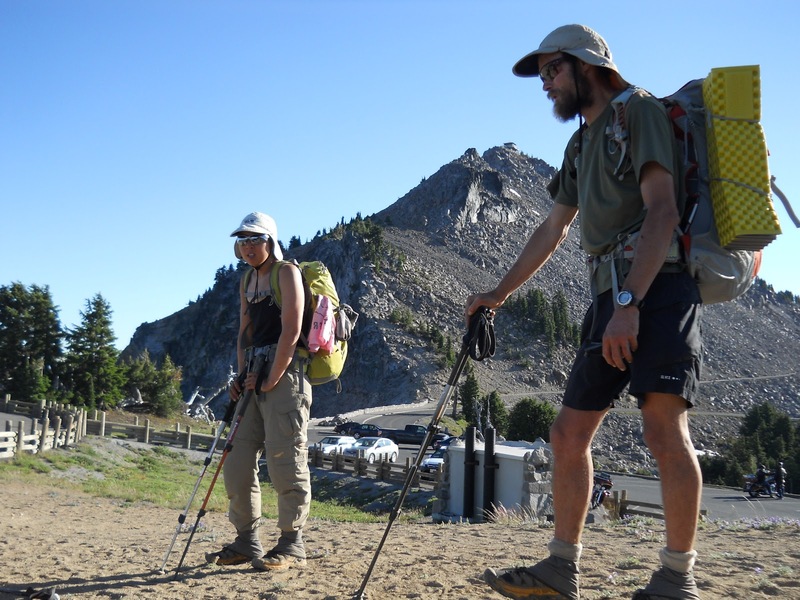 I was a little skeptical of those claims--I heard some people predicting that "nobody" would be able to cross the High Sierras too--but we managed to succeed. And while trail communication is remarkable, I couldn't fathom how news of the trail in Washington could reach us in Southern California--at least not accurately. Now I'd found five southbound thru-hikers who had started in Canada, with more on the way. 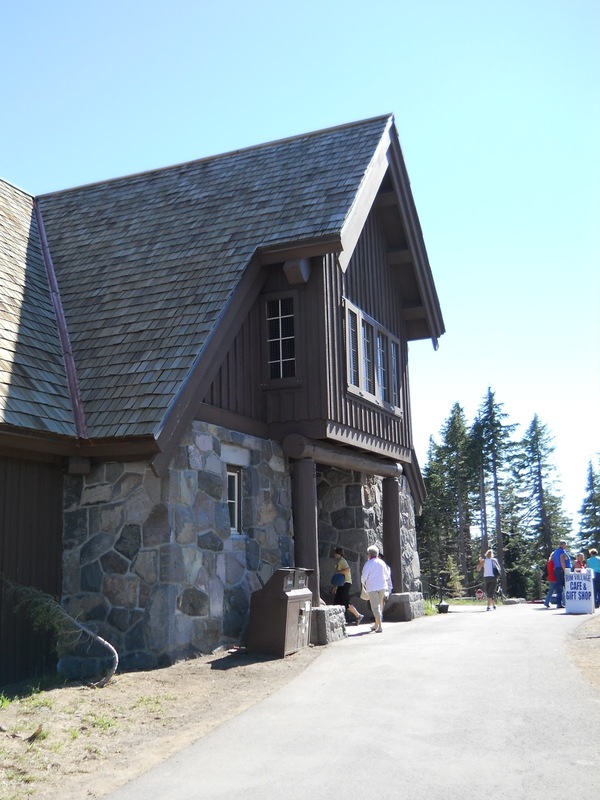 The trail wound its way around the Watchman, a fire lookout located on the highest point along Crater Lake's rim and the third Crater Lake hike described by Sullivan. Once the sun set, the mosquitoes came out in force. I was a little disappointed about that. The day had been the least buggy for several days and I hoped on the exposed rim where I was, they wouldn't be a problem at night either. I was wrong. The mosquitoes only bothered me for a couple of hours, however, before the wind picked up and blew them into submission. And it was a strong wind that picked up, blowing sand everywhere--into my hair, into my ears, into my gear. I didn't complain, though. No, I thanked the wind for the protection it provided against those blood-sucking mosquitoes. The two southbound thru-hikers I met today. 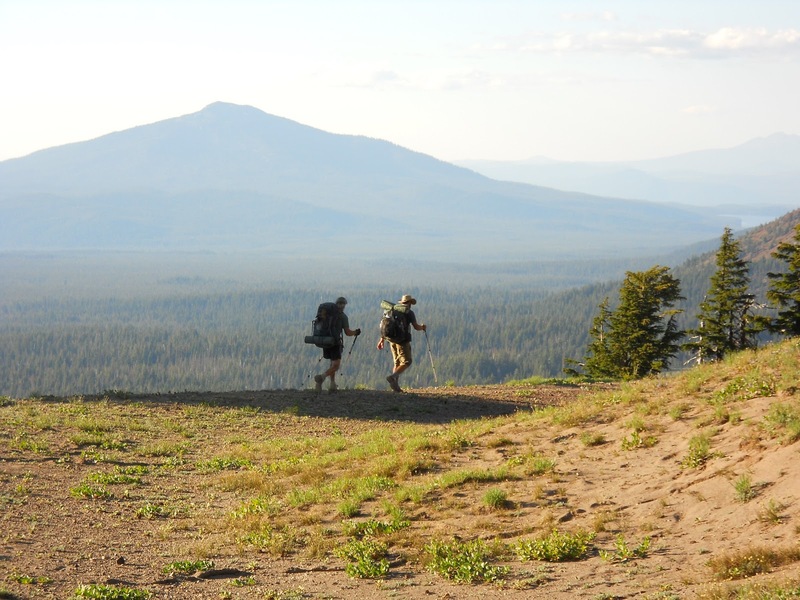 Just Dave (left) and Double D (right) hiking along the rim. I had a great view for the Perseid meteor shower here! OMG OMG OMG. Carter Lake is at the top of my West Coast Must See list. I would have had a hard time leaving that campsite!! BEAUTIFUL!!! Now I know why my B-I-L told us last summer, that we should stop and see Crater Lake on our way home (to So. Cal.) from Oregon. we'd had such a difficult trip though, health-wise, that we just wanted to get home. We drive to Oregon every year, though, so we'll have to write this into our plans. 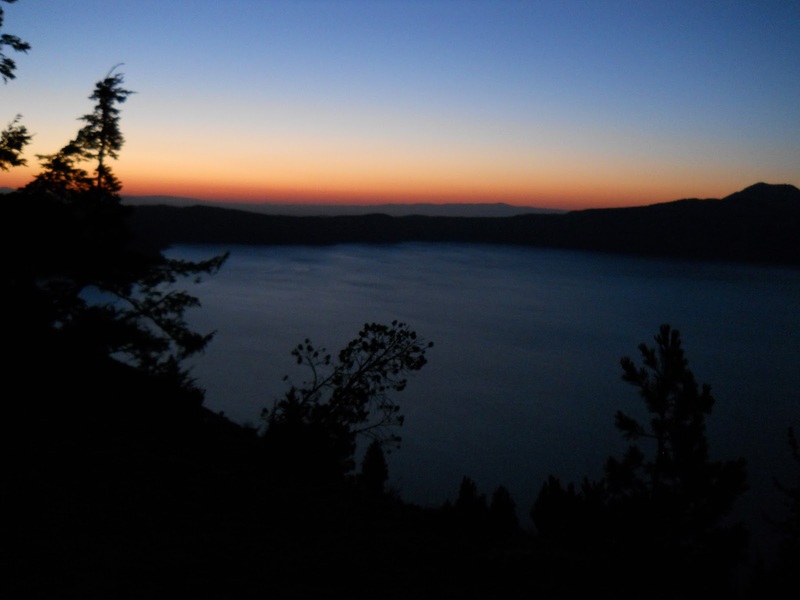 Crater Lake is amazing. I was very young when I visited, but I still remember being a little awestruck. I do find it fascinating how all the volcanoes in the PNW are referred to as mounts. Are there any mountains in Oregon or Washington that aren't volcanoes?